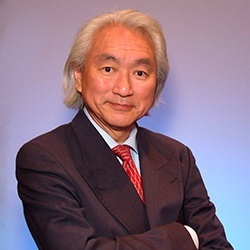 Dr. Michio Kaku is one of the most widely recognized figures in science in the world today. He is an internationally recognized authority in two areas. The first is Einstein’s unified field theory, which Dr. Kaku is attempting to complete. The other is to predict trends affecting business, medicine, finance, and our way of life, based on the latest research in science. He has written three NY Times Best Sellers. His latest, The Future of the Mind, hit #1 on the NY Times, Amazon, and Barnes and Noble Best Sellers List, making it the #1 hardcover, non-fiction book in the country. He appears regular on national and international TV, and hosts numerous science TV and radio programs. His Facebook site has over 2 million fans, and over 330,000 people regularly receive his tweets. He is the author of several international best-sellers. Besides The Future of the Mind, his other New York Times best-sellers include. Physics of the Future, and Physics of the Impossible. Other books include Hyperspace and Visions: How Science Will Revolutionize the 21st Century. For Physics of the Future, he interviewed 300 of the world’s top scientists, many of them Nobel Laureates and directors of the largest scientific laboratories, about their vision for the next 20 to 100 years in computers, robotics, biotechnology, space travel, etc. These are the scientists who are inventing the future in their laboratories. The Physics of the Future gives the most authoritative and most authentic understanding of the world of the future. 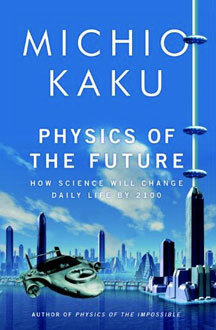 Physics of the Future was also chosen by Amazon as one of the Top 100 Books of 2011. His latest book is The Future of the Mind, which details the stunning breakthroughs being made in neuroscience, which are finally beginning to unravel the mysteries of the most complex object in the known universe, the human brain. Recent scientific advances in brain-machine interface have made possible a form of telepathy, telekinesis, recording and uploading memories, and even photographing thoughts. Dr. Kaku also does considerable public speaking on international radio and TV. He has appeared on the Larry King Show, Nightline, 60 Minutes, Good Morning America, CNN, CNN-Financial, ABC-TV News, Fox News, BBC-TV, BBC-Radio, PBS’s Nova and Innovation, Tech-TV. He ha also appeared on the David Letterman Show, the Colbert Report, the Conan O’Brian show, HBO’s Bill Maher Show, and has appeared on numerous science specials, including PBS’s Steven Hawking’s Universe, Science Odyssey, and Einstein Revealed, the BBC’s Future Fantastic, Parallel Universes, Copenhagen, Channel 4’s The Big G: the story of gravity, the Discovery Channel, the Learning Channel’s Exodus Earth, A and E, the History Channel’s Universe series and biography of Einstein, and many science documentaries. He was featured in the full-length, 90 minute feature film, Me and Isaac Newton, which was nominated for an Emmy in 2001. He was profiled in Tech-TV’s Big Thinkers series and is a regular commentator on that cable network. He has spoken on over 500 radio stations around the country. He has also appeared in a number of major science specials. In 2006, he hosted a four part, four part series for BBC-TV and BBC World on the nature of time, called Time. In winter of 2007, he hosted a 3 part, 3 hour Discovery-TV series about the next 50 years, called 2057. He has also hosted a new 3 part, 3 hour documentary, for BBC-TV about the future of science, called Visions of the Future. It aired in the UK in the fall of 2007, and received glowing reviews from the London newspapers, including the Times, Daily Telegraph, and Guardian. It also received some of the highest ratings for BBC4. He frequently keynotes major business conferences about the next 20 years in computers, finance, banking, and commerce. 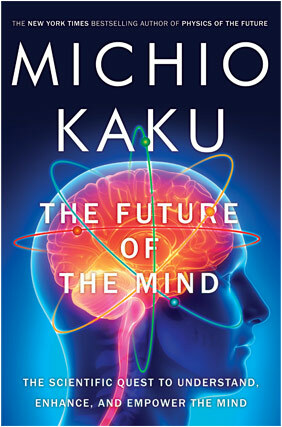 Based on interviews with over three hundred of the world’s top scientists, who are already inventing the future in their labs, Kaku—in a lucid and engaging fashion—presents the revolutionary developments in medi cine, computers, quantum physics, and space travel that will forever change our way of life and alter the course of civilization itself. * The Internet will be in your contact lens. It will recog nize people’s faces, display their biographies, and even translate their words into subtitles. * You will control computers and appliances via tiny sen sors that pick up your brain scans. You will be able to rearrange the shape of objects. * Sensors in your clothing, bathroom, and appliances will monitor your vitals, and nanobots will scan your DNA and cells for signs of danger, allowing life expectancy to increase dramatically. * Radically new spaceships, using laser propulsion, may replace the expensive chemical rockets of today. You may be able to take an elevator hundreds of miles into space by simply pushing the “up” button.